I have been hard at work on the relaunch of What Designers, so haven’t posted in a couple of days. That being said, I have been seeing a lot of fabulous designs…and just had to share these. 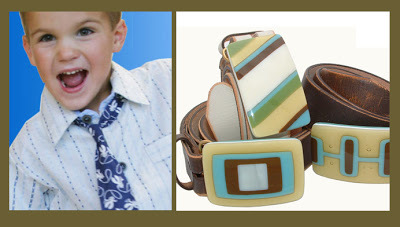 I love, love, love these boys ties by Pixel. The patterns are super-cool with a robot-hot rod-retro-monster aesthetic. I had a quick look and couldn’t find anywhere to buy them online – surely a mistake! Now, these belts are drop dead gorgeous. I was very close to buying one for a gift….but indecision has got the better part of me for the moment….and then there are the platters (not available online) that I could buy myself!! Anyway, handmade glass buckles on a distressed belt, $162, by Mark Joiner / Fourteenfifty Design.